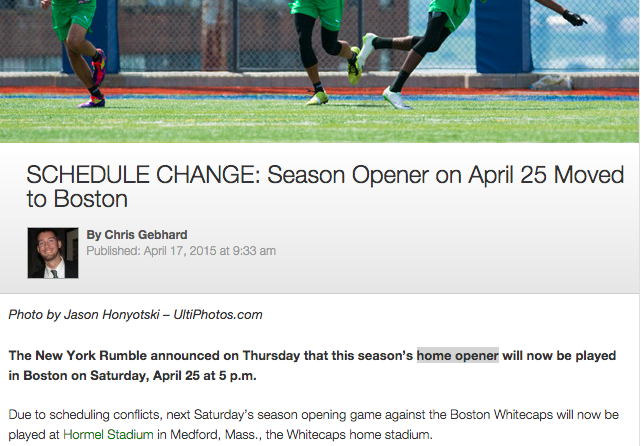 New York Rumble's first "home" game of the 2015 MLU season wasn't. August 8-August 9, 2015; twelve livestreamed games from a variety of media providers. @burnsideulti celebration of goaltimate in many, many, many, many different forms. Evan Lepler - as a solo broadcaster - announcing the final two minutes of a riveting game between San Francisco vs Seattle via AUDL Radio. Runner-Up: First weekday game in Pro Ultimate. A Thursday matchup between Toronto Rush vs Rochester Dragons. 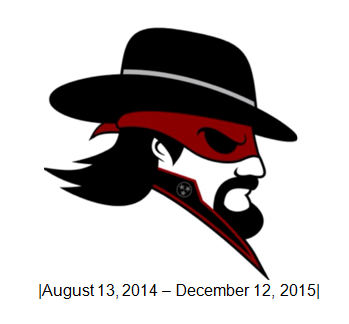 The 2015 calendar year was a busy 12 months! Here are some memorable moments that are USA Ultimate-related (teams, programs &/or events). "NO GLASS WHATSOEVER ON FIELDS! (Pickle jars prohibited)"
Minneapolis Drag'n Thrust. 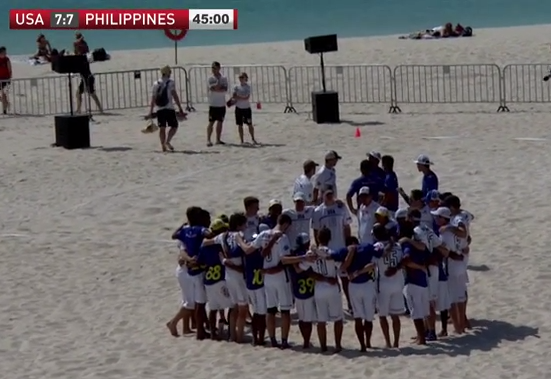 D'nT completed their three-peat at USA Ultimate National Championships (2013, 2014, 2015), and won PAUC 2015. Not to mention, winning WUCC in Lecco in 2014. The only thing Drag'n Thrust is dragging are championship trophies home to Minnesota. 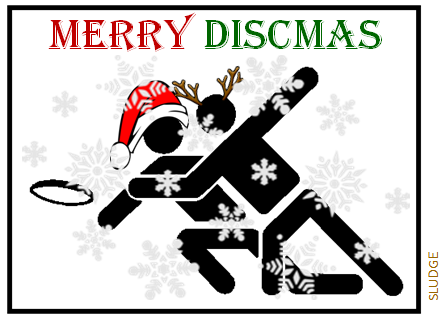 May your holiday be filled with mirth! 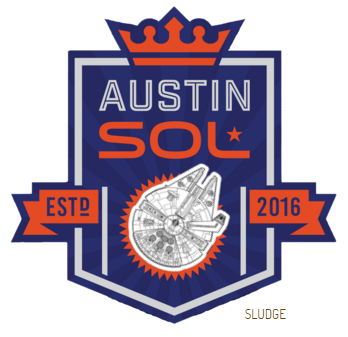 Below is a selection of AUDL team logos fused with an element of Star Wars. 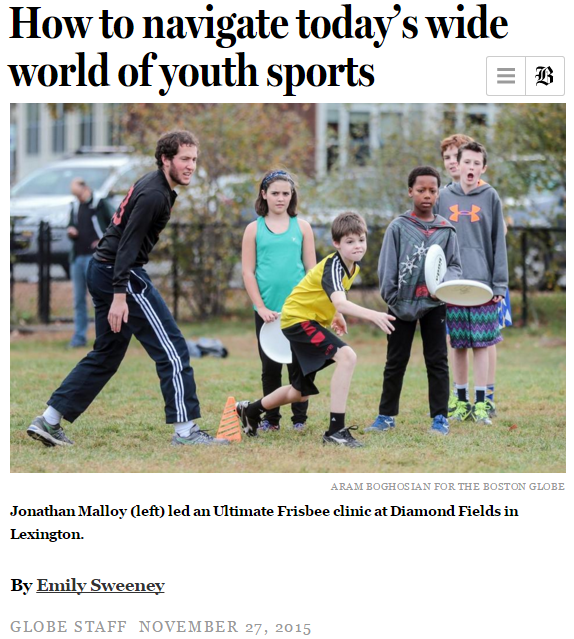 Last month, The Boston Globe published an article praising the benefits of ultimate - both in popularity and with stellar quotes. Radio Lab's podcast 'American Football' cites similar sentiments regarding football's decline. 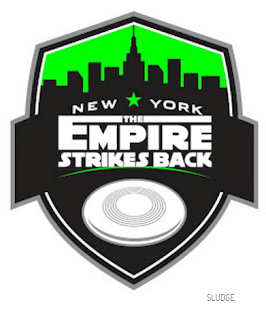 Local ultimate clubs should take note to start (or continue) youth-specific ultimate events and/or leagues. Why does Henry like Ultimate? "He says 'we don't have refs and there's a lot more running around." [Ultimate is described as] "an awesome" sport that combines "athleticism, good attitude, and fun" by Dean Ranzo. Ultimate Frisbee is the game of choice for Gillian Epstein's children. Her 13-year-old son has been playing for a few years, and this year her 9-year-old daughter signed up as well. "I appreciate that Ultimate is relaxed, all-inclusive, and very positive. We were thrilled that the program agreed to take younger ages this summer, and my daughter loves it — it was the only team sport she was willing to consider." 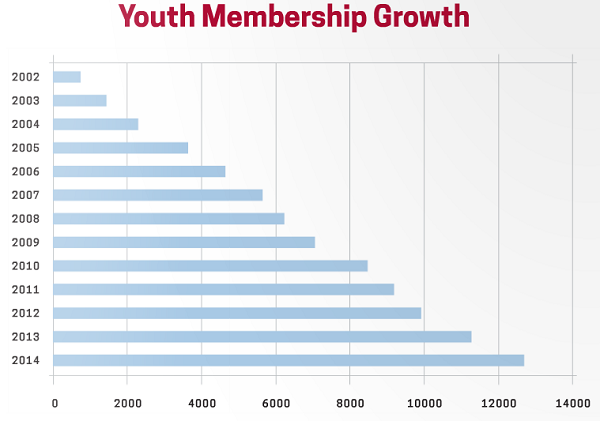 On the list of 11 sports charted in the article, the number of participants aged 6- to 12-year-olds in the sport of ultimate (439,000) is the highest compared to the other 4 sports with an increase in participation. 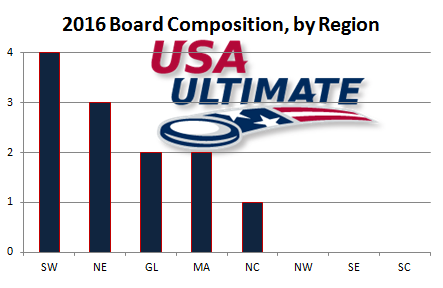 Ultimate- as a team sport - ranks 7th in participation (as of 2014) and ranks 5th in increased participation (since 2007). Since 2007, participation in ultimate by 6-12 y.o. has increased nearly 25% with 87,000 more participants. 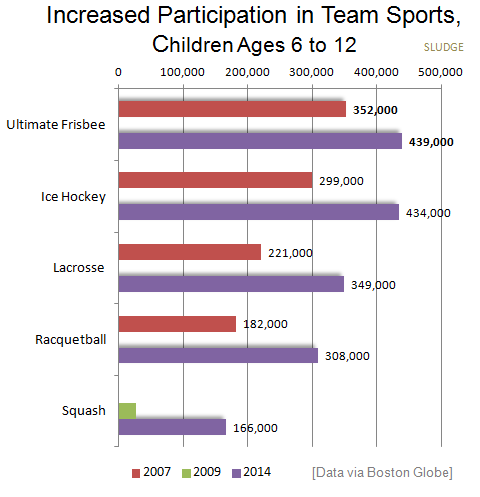 See below for a condensed chart on the five team sports with increased participation by 6-12 year olds. SFIA considered racquetball and squash as "team" sports. From the article: Just 40 percent of children ages 6 to 12 played team sports on a regular basis in 2013, down from 44.5 percent in 2008, according to the [Aspen Institute] report, which cited statistics from the Sports & Fitness Industry Association. Football has seen the steepest decline, but participation has also fallen in baseball, softball, soccer, and basketball. Meanwhile, more kids are playing racquetball, ice hockey, lacrosse, Ultimate Frisbee, and squash. RELATED: Ultimate had over 5 million participants per SFIA in 2012. 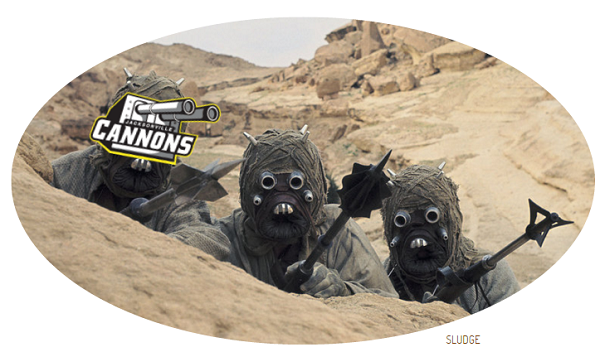 This week's Contested Strip by Megan Praz and Meghan Kemp-Gee pays tribute to the new Stars Wars movie, The Force Awakens. Megan and Meghan do an out-of-this-world job on The Force Abreakens. See below for a sampling of their creativity. 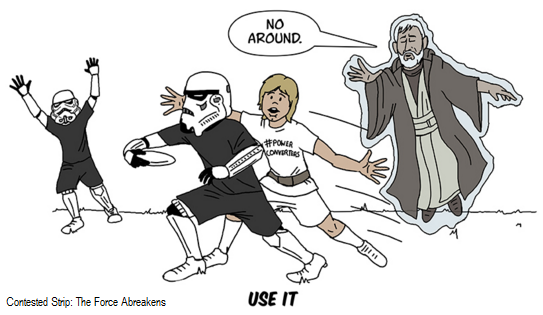 Obi-Wan Kenobi reminding Luke to use the force when marking the disc. Princess Leia Organa with the superfluous layout trying to catch the Frisbee. 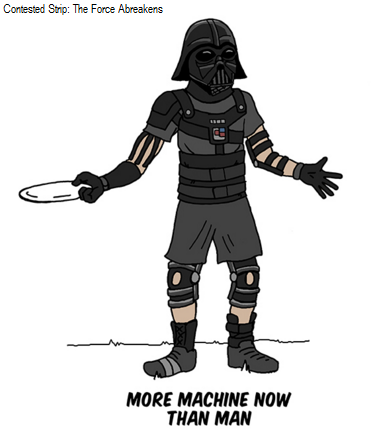 Darth Vader wearing so much protective equipment to play ultimate. If you play ultimate, then you have undoubtedly attempted to describe the sport. If employed, the topic of ultimate might come up during conversations with co-workers. "Driving to Illinois to play in an ultimate tournament." "Going to a 3-hour practice with my ultimate frisbee team." Does anyone know where the stapler is? What I'm try to say is that ultimate can be weaved into conversations at the workplace. There may not be much interest in your chatter about ultimate which makes Jody Avirgan's accomplishments a commendable act. According to his bio, he has worked at WNYC and currently works at FiveThirtyEight. Freakonomics Radio (in partnership with WNYC) claims to be one of the most popular podcasts in the world, with more than 5 million downloads per month. 538 is a favorite analytical site whose scope also reaches outside of politics. 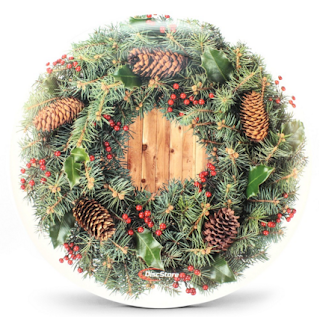 Avirgan has successfully incorporated ultimate into these work projects in 2013 and 2015. 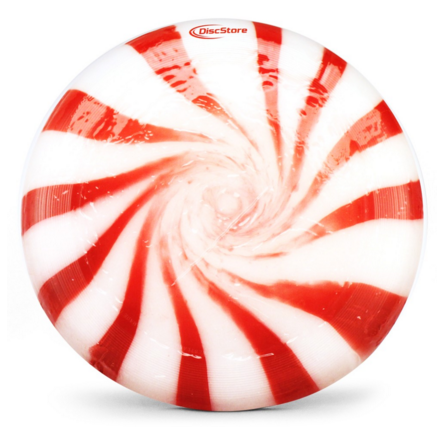 2013: What Do Skating Rinks, Ultimate Frisbee, and the World Have in Common? 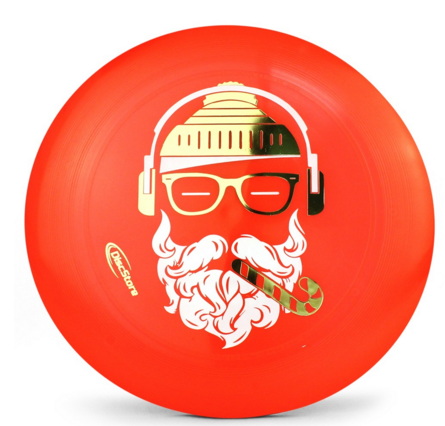 And, by doing so, has introduced ultimate to a wider audience. 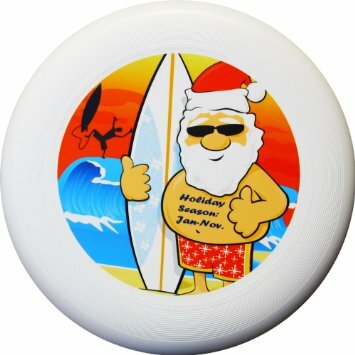 USA Ultimate's annual holiday card was just received! 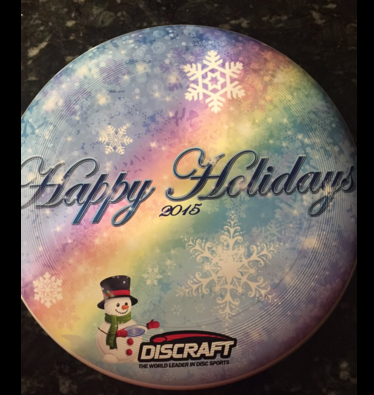 This 2015 holiday card from USA Ultimate is a dramatic shift from last year's card. Instead of a customized scene as in 2014, this image is more generic with 3 Cubism-ish snow capped mountains against a textured background with different-sized-yet-same-designed snowflakes. 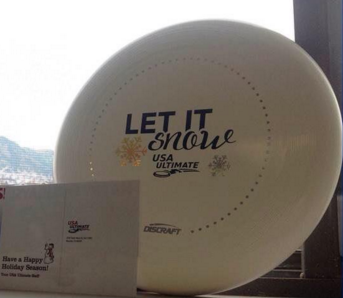 Similar to the red cup from Starbucks, USAU's happy holidays greeting is non-denominational and rather dull. For what it's worth, I do like the font type but disappointed with the lack of ultimate discs. 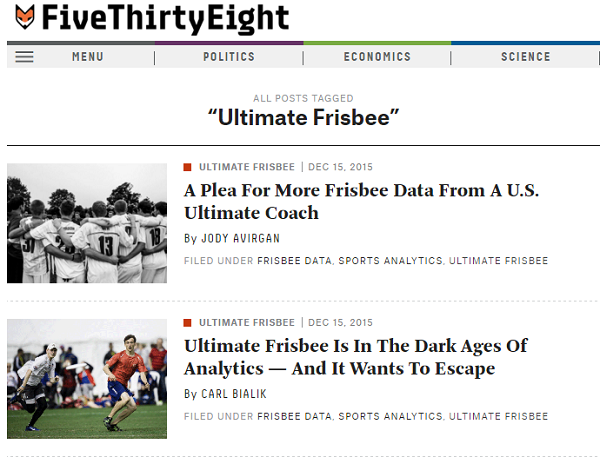 Yesterday, FiveThirtyEight published not one, but two, articles about the sport of ultimate. 538 is owned by ESPN, which is Disney-owned. The two articles appeared in their "Sports" section. 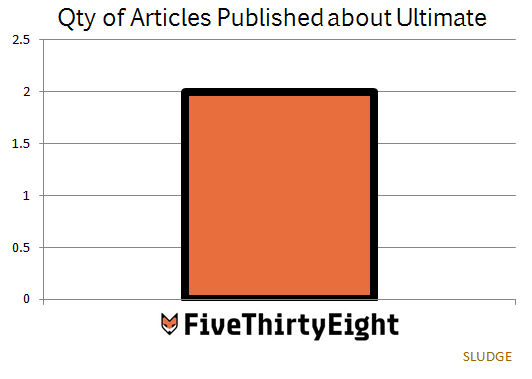 538 articles tagged as "Ultimate Frisbee"
Without proper data (collection), analysis cannot happen. Looking forward to additional coverage by 538 n the future. 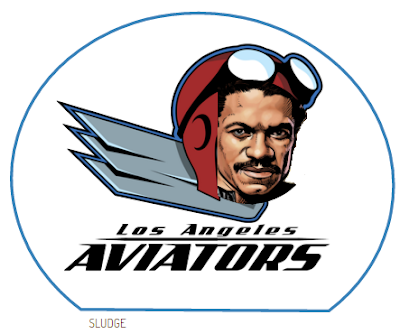 On this day in 2006, the record time for Maximum Time Aloft (MTA) was set....by an astronaut. Christer Fuglesang brought a Frisbee to the European Space Station and set the MTA record of 20.52 seconds. Wind was obviously not a factor, but he did use some breath during the record. Skip ahead to 2:30 to view the practice throw (or let-go) and the subsequent record throw. WFDF recognized this out-of-the-world flying disc record event as its own MTA category - "Galactic MTA." The current MTA World Record Holder - 16.72 seconds - on earth's land is Don "Sauce" Cain who enjoys wearing a hat signifying his WRH achievement. The SLUDE BLOG continues another day with today being a milestone. 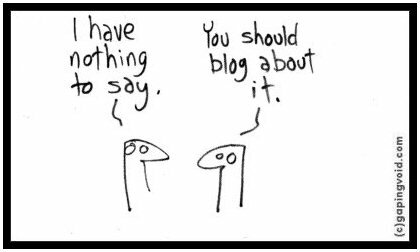 Today marks nine (9) years since our very first blog post (in 2006)! With 3,000+ posts, this blog is fueled by a daily cocktail of heckle, reporting, analytics, and a love for the sport of ultimate. Blogging about ultimate-related topics has become a regular activity with the hope of providing an ULTI-rnative resource. 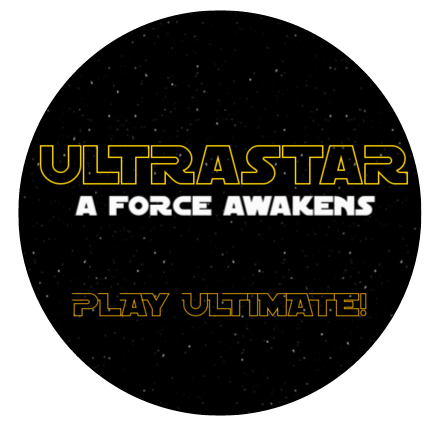 The primary purpose of this blog is to be fun — just like ultimate. Much appreciation for visiting &/or reading. After only one season, the Nashville NightWatch (AUDL) have upgraded to a new logo. Their 2015 logo was graded as a "B" in our annual pro ultimate logo review. As you can see, the difference between the logos is night and day. 1. 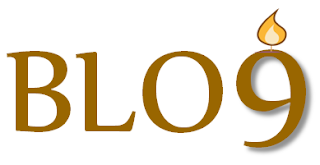 Long hair retained from the 2015 logo. 2. Three (3) stars from the Tennessee's flag are, again, represented. 3. Bandana shaped like the letter 'N' for Nashville (or NightWatch). 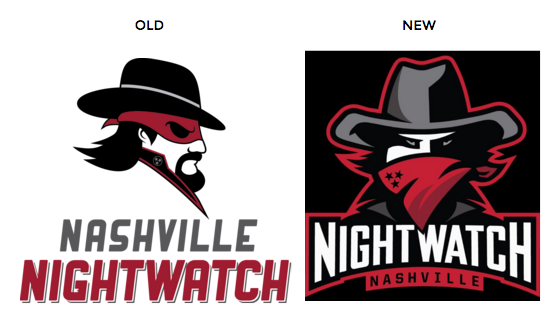 One could speculate that the goatee-and-eyemask logo truly did get another gig. 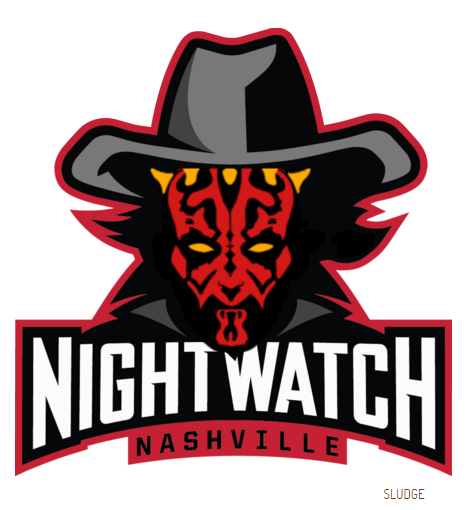 Nashville NightWatch finished 4th in the 5-team South Division with a (2-11) record in their inaugural season in the American Ultimate Disc League. 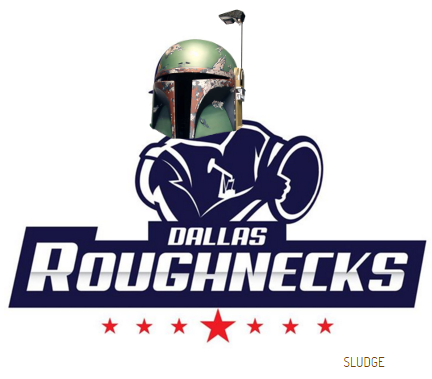 They are scheduled to compete in the 7-team South Division in AUDL 2016. 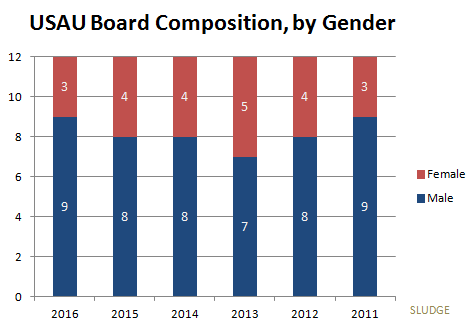 5 of the 6 appointed Board members are male. DeAnna Ball was elected by the board as president. Five (5) of the 8 club regions are represented. South Central, Southeast and Northwest are not represented based on Board members' location. The Southwest region is represented with 4 board members - all from California. The Mid-Atlantic region is represented with 2 board members - both from Pittsburgh. From the pro ultimate league that developed the "ultimate" field, comes another development for how ultimate scores are presented. If I had name rights to this box score for ultimate, its code name would be Ul+imate Box Score because of it adds to the game summary. Congrats on taking a more-is-better approach to recap an ultimate game. This upgrade to how ultimate is summarized shows nuances of our sport, plus an understanding of metrics. This data collection and summary also has charting potential. 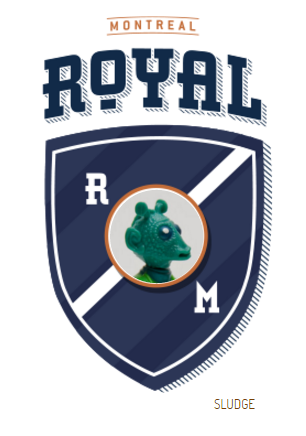 MLU has been sharpening their data collection, management and analysis under the tutelage of Luke Ryan (MLU Statistical Research & Analysis Coordinator). There's a certain simplicity to MLU's mathematical game summary even though there are many 36 numbers. This draft box score shows some real promise to succinctly inform fans about a game and to intelligibly present the sport. 1) Indicating which team won with a grey band. 2) Combining the first 2 quarters (1st half) to show a halftime score. 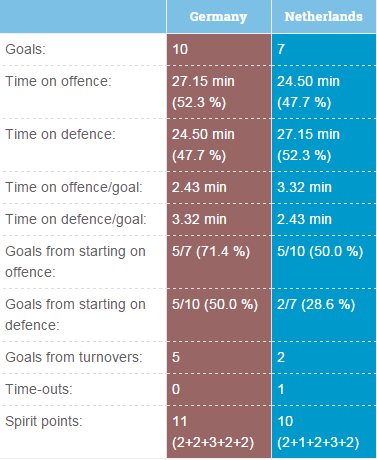 3) Consolidating how each team scored - O[ffense] and D[efense] - in the first half (top) and then the rest of the game (bottom) for comparison sake. 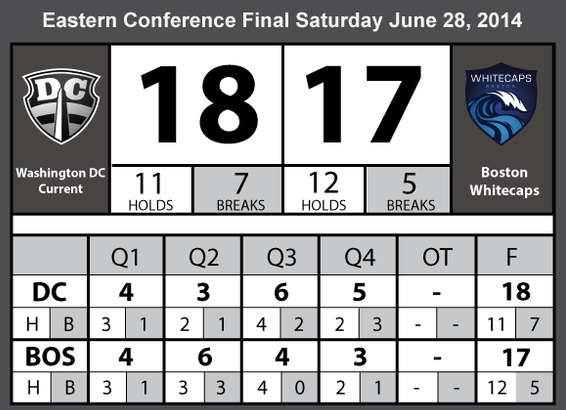 Looking forward to the final version of MLU's box score for their 2016 season. UPDATE [12/10/16] : A new draft was posted today. The fourth season of Major League Ultimate begins in 4 months! Five games are scheduled for the first weekend of MLU's 2016 regular season. 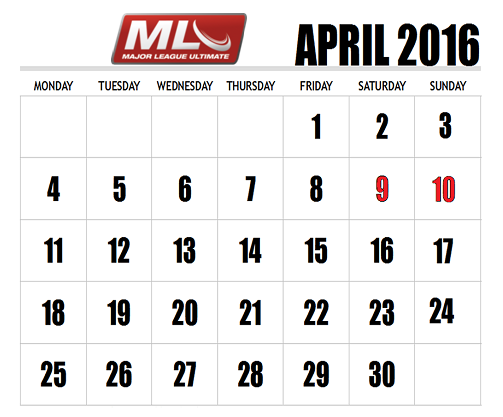 April 9-10 is the earliest start of the MLU season in its history. 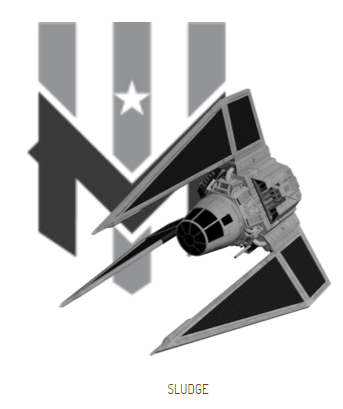 MLU Conference Championships are scheduled for June 25-26, 2016, and the MLU Championship is planned for July 16th or 17th. The 15-year-old Meetup for finding pickup ultimate around DC - The Washington Ultimate Frisbee Meetup Group - is currently leaderless and. as a result, will be shutdown next week. The original organizer stepped down because "The collections unfortunately do not cover the costs of this website anymore." Costs associated with a Meetup group like this were $14.99/month. The Meetup group touts nearly 2500 players and has organized over 1600 games. The Meetup group is now being hosted on Facebook. The Meetup-turned-Facebook Ultimate Frisbee Group currently has 261 members and continues to organize (for free) weekly games in Virginia, Maryland, and the District. 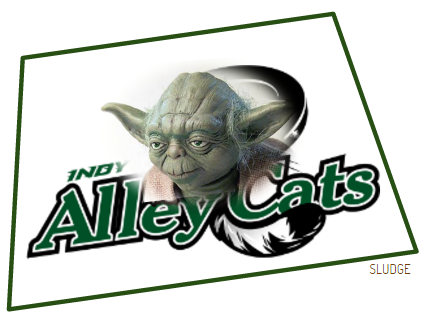 UPDATE [12/17/2015]: Tim Smith (WAFC's new Executive Director) stepped in as the Meetup's Organizer. The Washington Ultimate Frisbee Meetup Group lives on to play another day game. The fourth Major League Ultimate season for D.C. Current starts earlier on the calendar than any season before - on April 9th. 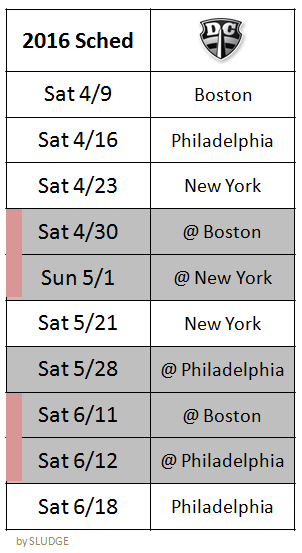 In its 10-game regular season, DC plays 3 games versus Boston Whitecaps (2 away, 1 home), 3 games versus New York Rumble (1 away, 2 home) and 4 games versus Philadelphia Spinners (2 away, 2 home). 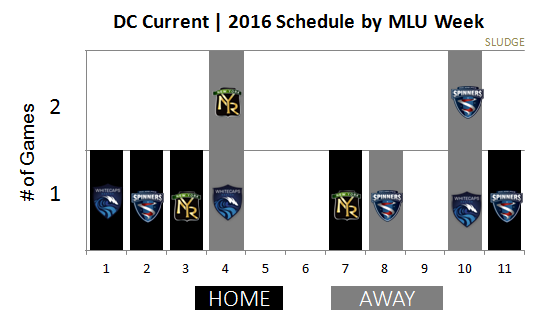 The Current have back-to-back games in weeks 4 and 10; DC is one of 3 MLU teams with more than 1 back-to-back games on their 2016 schedule. MLU's DC team has 3 bye weeks during the season.